Lhakhang which believed that one can see caves where Guru Rinpoche (Padmasambava) meditated during 8th century. After the temple visit, continue with Paro sightseeing at Paro Dzong, which is the main fortress of Paro valley. Drop to hotel, overnight Paro. Morning hike to Chumphu Lhakhang (Paro), it takes about 4- 5 hours hike to reach . The walk is casual and not too tiring as the hike path goes through the forests, lot of shade and cool breeze. There are several caves used by Guru himself and some caves used by his consorts like Khandom Mendharawa and Khandom Yeshay Tshokey. There are water falls said to be the bathing place of Guru and there are big rock that said to be the opening gates to Heaven. After hike drop to hotel, overnight Paro. as regarded as “the Devine madman”. The temple Chimmi Lhakhang is regarded as the temple of fertility. Dropt to hotel, overnight Punakha. Bayul Langdrak, which is considered a very Holy site in Bhutan. According to sacred texts, Guru Rinpoche returned from Zangdokpalri for a seven-day sojourn in Bey Langdra. On His arrival, Terdak Langdrapa, a local diety, caused obstacles to the Guru. However, manifesting as Urgyen Dorje Guru, the Guru subdued the diety and appointed him as the protector of the treaure-teachings. It is said that Guru Rinpoche has hidden approximately 60 terma here. Gangtey Tulku who is the reincarnation of a famous Terton (Treasure discoverer) of Guru Pamasambava. After the monastery visit, continue drive to Bumthang. Overnight Bumthang. Bumthang sightseeing. Bumthang - where Guru first visit in 8th Century is considered one of the holiest district and important place to visit Guru Nye(Sacred sites of Guru) due to Guru Pamasambava was invited to visit Bhutan by the 8th century King called “Sindu Raja” who was haunted by an evil spirit in that region. It is said that the King had fallen ill because the evil spirit has taken away his soul. On Guru’s arrival, he subdued all the evil spirits and restored the king’s good health. The emanation of Vajrakilaya, The First Padtshaling Trulku,H.H. Drupthop Namgyal Lhundup(1718~1786) established Padtselling Monastery in 1769 as per the prophesy of Lhasa Jowe after completing the recitation of Phagpa Zabgpo Chodpai Monlam hundred thousand times. He received all the treasure teaching of Chimi Longsel Dorji Sogdrup from Rigzin Drime Lingpa, Longchen Nyingthig teaching from Rigzin Jime Lingpa and Drukpa Kajug from Je Nawang Drukpa (regin:1724~1730) and Je Shkya Rinchen. In brief, for the well being of all sentient beings. He subdued evil spirits, devils and zombies in Bhutan, India and Tibetan. He discovered many treasure for the faithful lots in future. This monastery seat has been hence by the successive incarnation known as Padtselling Tulku. The present Padtselling Tulku, H.E Pema Kunzang Tenzin Jamtsho was born in 1960 to the descendant of great Terton Dorje Lingpa at Bumthang. He was recognized as the fifth Padtselling Tulku at a very tender age by Ranjung Rigpai Dorje the sixteenth Karmapa. He was enthrone as fifth Padtselling Trulku by tenth Pealling Thuksa in the year 1970, the H.H The 67th Jekhenpo of Bhutan enrolled him in the Central Monastic Body of Punakha / Thimphu as a novice monk and he was first batch to be pass out from the Tango Shadra. Then visit Maybar Tso（火焰湖）, which is regarded as the Burning lake, where it is believe that Guru hid many holy scriptures along with spiritual treasure which was discovered by a famous Terton called “Pema Linpa”. After lunch visit Kurjay Lhkahng where there is a cave Guru meditated and left his body imprint. Visit Jambay Lhakhang which is one of oldest Buddhist temple in Bhutan built in 7th century. Drop to hotel, Overnight Bumthang. Moving from the central Bhutan to Eastern region of Bhutan. The journey will take 6-7 hours, and short sightseeing along the way and on arrival to Mongar, check in Hotel and overnight Mongar. Drive to Gom Kora, which is yet again a holy site of Guru padmasambava. It is believe that Guru Rinpoche meditated here and left a body impression on the rock. The site hold a story, whereby Guru subdued an evil dragon here crushing into the rock leaving an impression of the dragon’s body and his hat. Guru also hid a Tshubum or vase containing the water of immorality inside the rock. Pilgrims may be fortunate to have opportunity to taste the water if it trickles out of the rock when they visit. Visit Chorten Kora at Tashi Yangtse where there is a fomous Buddhist stupa, where it is believed that a princess from India scarified her life to be buried inside the stupa alive in order to subdue the evil spirits in the region that was destroying the lives of people at that time. Drive back to hotel, overnight Trashigang. Drive back to Monagar, visit Dramtse Lhakhang which means “the peak without enemy”. This monastery is the largest and the most important in the eastern region suited about 18km away from Tashigang to Mongar highway. The temple is founded by a highly accomplished Ani (Nun) named Choten Zaongmo in the 16th century who is the granddaughter of a famous religious master Terton Pema Lingpa. Overnight Mongar. morning visit to Yakang Lhakhang which is located 20 minutes walk from Mongar, this privately owned monastery was founded by Lama Sangdag, who is the 6th son of Terton Pema Linpa. Continue drive to Bumthang. On arrival check in Hote. Overnight Bumthang. On arrival, drive to Thimphu which is the capital and the most developed town in Bhutan. Visit Memorial Chorten, Buddha point, Takin zoo, Tashi Cho Dzong. Check in hotel, overnight Thimphu. Morning hike to Tongo Monastery, which would take about 2 hours, after lunch visit Changang Lhkahng which is a 14th century Buddhist temple. After sightseeing drive to Paro Valley, overnight Paro. 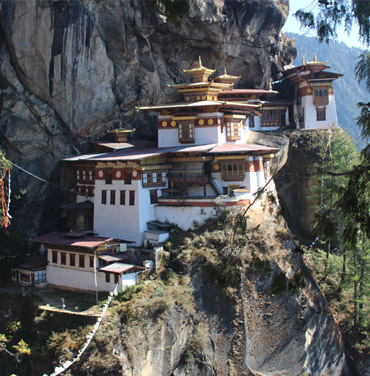 Tiger’s Nest hike, this monastery is located 800 meters above Paro valley on a vertical cliff. This is a very important site where it is believed that Guru Rinchoche in one of his Wrathful manifestation flew on back of a Tigress and meditaed there for 3 years. The hike duration will be 6-7 hours. After hike drive back to Hotel. Overnight Paro.